Is Nasdaq, Inc. (NASDAQ:NDAQ) a superb stock to buy now? The smart money is in a bullish mood. The number of bullish hedge fund bets moved up by 1 recently. 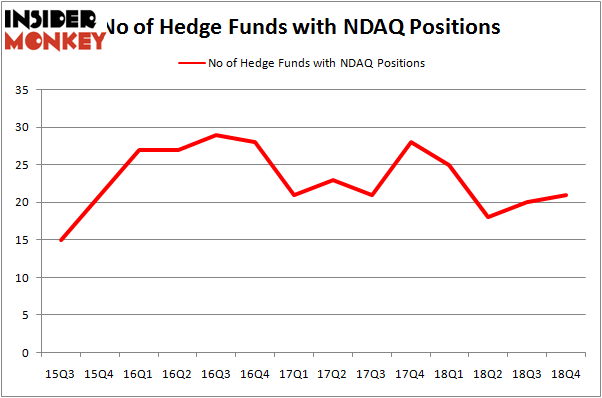 Our calculations also showed that NDAQ isn’t among the 30 most popular stocks among hedge funds. We’re going to view the latest hedge fund action surrounding Nasdaq, Inc. (NASDAQ:NDAQ). How are hedge funds trading Nasdaq, Inc. (NASDAQ:NDAQ)? At Q4’s end, a total of 21 of the hedge funds tracked by Insider Monkey were long this stock, a change of 5% from one quarter earlier. Below, you can check out the change in hedge fund sentiment towards NDAQ over the last 14 quarters. With hedgies’ sentiment swirling, there exists a few notable hedge fund managers who were upping their stakes considerably (or already accumulated large positions). Among these funds, D E Shaw held the most valuable stake in Nasdaq, Inc. (NASDAQ:NDAQ), which was worth $91.8 million at the end of the third quarter. On the second spot was AQR Capital Management which amassed $28.4 million worth of shares. Moreover, Millennium Management, Arrowstreet Capital, and Adage Capital Management were also bullish on Nasdaq, Inc. (NASDAQ:NDAQ), allocating a large percentage of their portfolios to this stock. As one would reasonably expect, some big names have jumped into Nasdaq, Inc. (NASDAQ:NDAQ) headfirst. Renaissance Technologies, managed by Jim Simons, assembled the most valuable position in Nasdaq, Inc. (NASDAQ:NDAQ). Renaissance Technologies had $9.9 million invested in the company at the end of the quarter. Ken Griffin’s Citadel Investment Group also initiated a $3.6 million position during the quarter. The other funds with new positions in the stock are Claes Fornell’s CSat Investment Advisory, David Costen Haley’s HBK Investments, and Jeffrey Talpins’s Element Capital Management. Let’s go over hedge fund activity in other stocks similar to Nasdaq, Inc. (NASDAQ:NDAQ). These stocks are HCP, Inc. (NYSE:HCP), Cardinal Health, Inc. (NYSE:CAH), Mercadolibre Inc (NASDAQ:MELI), and Restaurant Brands International Inc (NYSE:QSR). This group of stocks’ market values match NDAQ’s market value. As you can see these stocks had an average of 32.75 hedge funds with bullish positions and the average amount invested in these stocks was $1523 million. That figure was $207 million in NDAQ’s case. Restaurant Brands International Inc (NYSE:QSR) is the most popular stock in this table. On the other hand HCP, Inc. (NYSE:HCP) is the least popular one with only 28 bullish hedge fund positions. Compared to these stocks Nasdaq, Inc. (NASDAQ:NDAQ) is even less popular than HCP. Considering that hedge funds aren’t fond of this stock in relation to other companies analyzed in this article, it may be a good idea to analyze it in detail and understand why the smart money isn’t behind this stock. This isn’t necessarily bad news. Although it is possible that hedge funds may think the stock is overpriced and view the stock as a short candidate, they may not be very familiar with the bullish thesis. Our calculations showed that top 15 most popular stocks among hedge funds returned 19.7% through March 15th and outperformed the S&P 500 ETF (SPY) by 6.6 percentage points. Unfortunately NDAQ wasn’t in this group. Hedge funds that bet on NDAQ were disappointed as the stock returned 3% and underperformed the market. If you are interested in investing in large cap stocks, you should check out the top 15 hedge fund stocks as 13 of these outperformed the market. 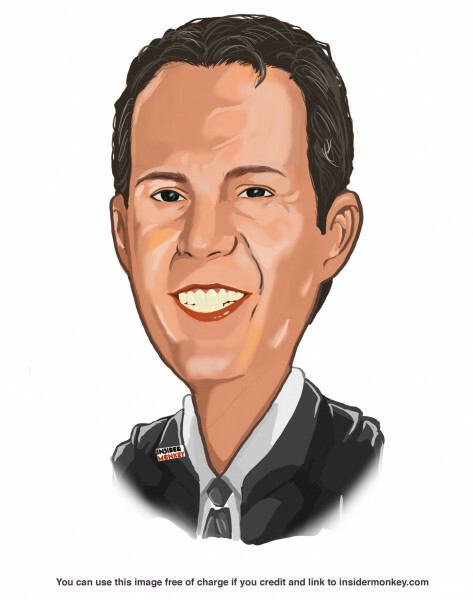 Here’s What Hedge Funds Think About ABIOMED, Inc. (ABMD) Here is What Hedge Funds Think About American Airlines Group Inc (AAL) Here’s What Hedge Funds Think About Total System Services, Inc. (TSS) Here’s What Hedge Funds Think About Cheniere Energy, Inc. (LNG) Did Hedge Funds Drop The Ball On Markel Corporation (MKL) ? Did Hedge Funds Drop The Ball On Plains All American Pipeline, L.P. (PAA) ?